Several Friday nights ago, my daughter was at a school social. The social was oddly timed – Friday night, 630-830pm. By the time you dropped them off, you had to turn around and go back to get them. Hmmm… how to spend the time? The few hours seemed like a great opportunity to get together with school mom/friends I don’t often have a chance to see. Rather than sit around and compare notes on kids and school, I thought it could be fun if we stepped outside of our mom lives and stepped into our girlfriend lives instead! Now, many of these women have great taste. I appreciate how some of them wear really fun accessories. And when I comment on their style, some say, ““Oh, this old thing?” Well, I personally would love their old things. 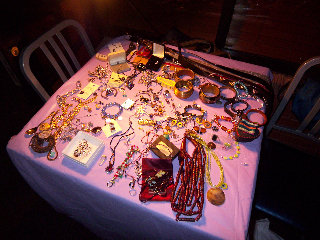 So, I suggested we clean out our jewelry/accessory drawers, meet for drinks and swap “old things”. This way, we could clean out our drawers (something all of us could easily do) and walk away feeling as if we had something new. It was a blast! 14 of us gathered at the local pub and set our treasures up on a table (and a few chairs). We drew numbers from a hat and went in order. We agreed that we would choose two items at a time and continue to go around, for as many items and as much time as we had. I couldn’t believe what some girls brought. Wow! There was so much, that we had the added bonus of donating jewelry, bags and scarves to the local women’s shelter at the end of the evening. It was heart warming to see how happy everyone was with their finds. I personally walked away with a fabulous pair of earrings to match some bangles I had just bought. A total score! Capital One asks, “what’s in your wallet?” However, I encourage you to think about, “what’s in your drawer?” How can you mindfully generate opportunities to spend time with friends and re-purpose what you have? The possibilities are endless! Leave your ideas below and let us know what you create!